Small Business Trends tops the list of SMB-focused websites, occupying the #1 spot on Blog Rank’s list of 100 small business blogs. We recently had the opportunity to talk to Anita Campbell, entrepreneur and CEO of Small Business Trends. Here are the highlights, including her tips on succeeding in today’s economy, maximizing your web presence, and creating a richer experience for your customers. What are your thoughts on the economy during the first half of 2011? There was a lot of optimism during the first half of 2011. Overall, things were positive, but weak. The economy didn’t really take off the way we were hoping, and we still have high unemployment. There is definitely some concern that we might be going into the dreaded double-dip recession. More and more people are talking about that, along with the loss of purchasing power due to inflation. What can small businesses do to be successful in this economic climate? Don’t get hung up on what someone is saying on CNBC. I love watching financial shows, but when you listen, you’re hearing someone’s opinion, filtered by what industry they’re in and what their interests are – so it’s not necessarily reflective of reality. As a small business owner, your reality is your industry, your local area, and the customers you serve. For a small business to be successful, it’s important to maintain a sense of optimism for your own business, to ensure that you have a line of credit and available cash, and maintain secure relationships with your key customers. Cash flow can be a challenge for small businesses, so it’s essential to limit your risk there as much as possible. What’s the outlook for the second half of this year? Well, the economy doesn’t look like it’s going to be hugely strong. I think we’ll see a weak recovery continuing. It’s important to remember that even if the world around you is slow, you can still achieve success by focusing on the factors we talked about earlier – optimism, cash flow, and preserving key customer relationships. Time is such a limited resource for small businesses. What is the most important way to maximize your web presence, without spreading yourself too thin? Your website is the core of your online presence. Make sure your website represents you well, because it’s how prospects and potential customers will get to know you. John Batelle, who was the founder and editor of Wired magazine and is now chairman of Federated Media, has famously said that everybody is in the media business today, and in particular small businesses are in the media business. What he means is that you have to become a publisher, because the core of how your customers, prospects, and business partners interact with you is around online content, and sharing of that content. Making content shareable increases your online visibility and helps keep you top-of-mind with, let’s say, a prospect who may be considering making a purchase but isn’t quite ready, or just someone who’s on your radar that you might want as a potential customer. How do you see the role of social media in content creation and sharing? A blog is a great way to add content to your website. Just set up a blog, link to it from your website, link back to your website from your blog, and voila – you can add content to your website quickly and easily. Facebook and Twitter are really good for businesses that sell to consumers, but can also be used for businesses that sell to other businesses, too. The point of these social media sites is to think about them as places to share content from your home base (your website and blog) with the world. They are also wonderful platforms to develop a little more human interaction, and for others to share word-of-mouth about your business. How can small businesses capitalize on some of the technology trends in the marketplace? New channels, like mobile and tablet-based platforms, are a great opportunity to create a richer customer experience. More and more of your customers are using smart phones and other devices, like tablet PCs, and you want to make sure you’re making it easy for them to get information and to do business with you on that type of device. An app that allows customers to perform transactions with you on a mobile phone or tablet is a good idea. We’re seeing a lot of people exploring QR codes now, so you could provide additional information or link to videos by letting users scan a QR code with a mobile phone. Simple steps, such as making sure your web site has a mobile template, are important as well. Providing a richer experience for the customer is a way to completely distinguish yourself and gain an advantage over your competitors. 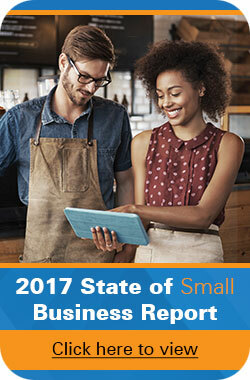 What steps has your small business taken to stay successful this year? What’s your outlook for the second half of the year? Let us know in the comments! Hi Grant and the team at Wasp Barcode, thank you for the interview opportunity. It’s so much fun to talk with people you like. Anita: Thank you for the great interview material… it’s always a treat talking with you. Hopefully, some of these ideas will help the small business owners providing inspiriation and some tips to navigate the back half of the year. Andrea: I had the easy part… just talking with Anita and recording the conversation. You then turned this raw material into an easy to read, understandable and interesting story. Fantastic job and thank you!!! I have question to the “code” experts: What’s the difference between a barcode, RFID and QR code? Regarding the question about the economy, I recommend you to follow the Purchasing Managers’ Index. Hi Martin. Let’s start with barcodes & QR codes. A QR code is just a type of barcode. Barcodes can be either 1D or 2D. 1D barcodes store a limited number of characters (ideally around 13), but 2D barcodes like the QR code let you store a lot more information – like a URL or physical address. QR codes are getting a lot of buzz because they connect offline marketing to online marketing. Customers can use a mobile phone or barcode scanner to scan a QR code on a printed ad and instantly get routed to a website, video, or other online media. 1D and 2D barcodes and RFID can be used to track items, like assets or inventory. To get information from a barcode, it must be scanned one at a time with a reader. Items with RFID tags can be read en masse by simply passing under a reader. So if you were adding a pallet of items to your stock with barcodes, you could need to scan each item individually. With RFID, you could scan all the items on the pallet at once. Another common use of RFID is the toll tag in your car – when you drive under a reader, the information from your toll tag is recorded using RFID. That’s how they know to charge you! The major drawback of RFID is cost of infrastructure and labels – it’s pricey, so not ideal for most small businesses or for tagging inexpensive items.